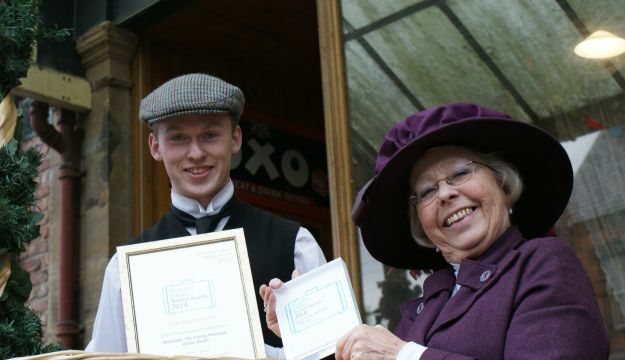 Beamish is celebrating after being named Large Visitor Attraction of the Year at the region’s “tourism Oscars”. The Museum won a Gold Award at the North East England Tourism Awards 2014 at Sunderland’s Stadium of Light on 11th November 2014. The honour comes at an exciting time for Beamish – a record 589,474 people visited in 2013/14 and 2014/15 is on course to top that figure. The Museum has ambitious plans to build a 1950s Town and Upland Farm, and a Georgian Coaching Inn, in a project that has received initial support for a £10.75million grant from the Heritage Lottery Fund. Councillor Carl Marshall, Chairman of Beamish’s Board, said: “This award is a tribute everyone at the Museum – the staff, volunteers and trustees, and everybody who has been involved, over the last few years, in making Beamish the place it is today. The North East England Tourism Awards 2014, which were presented by BBC Look North’s Carol Malia, honoured the best of the region’s visitor attractions and tourism businesses. Gold, silver and bronze and highly commended awards were given out in 15 categories. Winners at the regional awards have the chance to compete nationally at VisitEngland’s Excellence Awards 2015.